1. Keep them short and sweet. Despite the appeal of longer nails, keeping them short will ensure cleanliness and health all season long. Julep suggests starting with the coarse side of the nail file and finishing with the finer side for smooth edges. 2. Moisturize! Between your cuticles, hands, and nails, everything should be moisturized with extra care during the dry months. Pocket-sized hand creams and cuticle serums are the perfect on-the-go products to ensure hydration all day long. 3. Go metallic. This is more of an appearance preference rather than health, but I love bringing out my metallic nail polishes in the wintertime to celebrate the holiday season. Champagne shades like mine create a subtle shine that will still match almost any look. To embrace the idea of winterizing your look, today's post also features an easy-chic cold weather outfit for everyday wear. Nothing says winter like a pop of faux fur, which this mixed media jacket incorporates nicely into a versatile outerwear piece. Since I'm sporting my usual monochrome uniform, I decided to play off the warm tones of my nail polish with the panama hat and olive green clutch. I winterize my outfits by adding personality to neutrals. How about you? 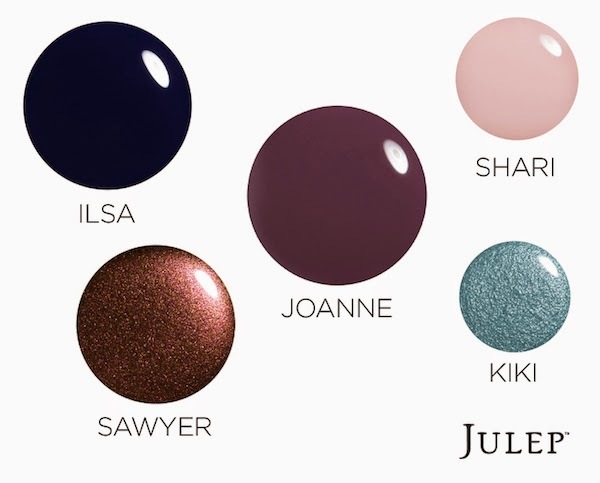 Speaking of color, Julep has provided a few of their favorite shades below for the ultimate wintertime look. I particularly love Shari and Sawyer, from which I took inspiration for today's polish choice. Feel free to leave me a comment about your favorite wintertime nail polish, and check out Julep's collection here for even more inspiration. I hope this post has helped you start winterizing from head to toe! Disclaimer: This post was written in partnership with Julep. All opinions are my own. your look is perfect and I love your nail color! Thanks Vanessa! Have a great week as well! Great look! I love that jacket! Your advice is lovely. For metallics, I would add using shimmery and sparkly nail polish since it's harder to remove and will last a longer time. And I'm loving the Sawyer color! 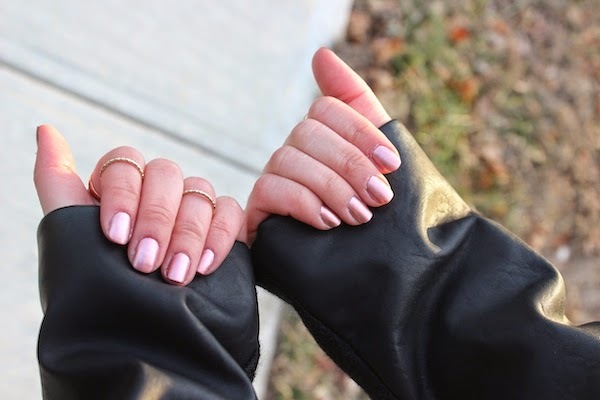 Obsessed with your jacket and loving the metallic nails! Thanks Preeti!! I'll have to wear it more often! I am in love with that lucky penny nail color! So beautiful on you! P.S. you have to check out our Day Trippin’ to Marfa, Texas post that we are sharing on the blog this Tuesday! Haha thank you Gabby :) You're so sweet! metallic nails suit you. I'm lovin' the jacket! You are looking so chic as always! Definitely love the nail polish and the jewelry!